In New Jersey, job openings for candidates with post-secondary certificates or associate degrees are on the rise. From construction to healthcare, vocational occupations in New Jersey need to be filled by qualified workers who have trained at one of the state’s high school or college-level trade schools. Supported by comprehensive high schools, vocational school district systems, early-college programs, and technical and community colleges, New Jersey students have a wealth of opportunity to prepare for in-demand careers. 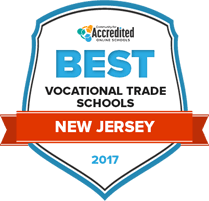 The following guide explores the growing industries and options for vocational and trade school education in New Jersey. In New Jersey, students are able to choose from any number of trade and vocational school opportunities. The most popular opportunities found at New Jersey's trade, vocational career and community college schools are likely to include healthcare and construction, two of New Jersey's fastest growing industries. Our rankings of accredited New Jersey schools can help students narrow down the options; we looked at factors such as tuition and student-teacher ratio. Classes at Camden County College are taught at the school's Camden, Blackwood or Cherry Hill campuses. Associate degrees in vocational subjects that prepare adults to become an apprentice include automotive technology and ophthalmic science. Practical and theory training is a part of these classes. Other associate degrees are in computer technology, health and exercise, massage therapy, nursing and paramedics. Three day workshops for prospective students cover taking the Accuplacer exam, time management skills, effective studying habits and college readiness. During the workshop, adults are also given a tour of the campus. Workshops are held at the college's Blackwood or Camden campuses. Located near New Jersey's capital city of Trenton, Mercer County Community College is a publicly supported college that started in 1966. Nearly 12,000 students take one or more classes at the school annually. Class sizes are small at approximately 21 students per class. A total of 75 associate degrees are offered at the college. Degrees in the vocational fields include aviation, automotive, construction, exercise science, game design, occupational therapy assisting and heating, refrigeration and air conditioning. Transfer programs at the college exist to help students maintain their credits as they pursue Bachelor's degrees at four-year colleges. Acceptance into a degree program depends on an applicant's previous academic performance and professional recommendations. The admissions process at Cumberland County College requires adults to complete an admissions application, submit transcripts and submit college entrance scores. Cumberland County College accepts SAT scores. Adults can also complete Accuplacer testing to get admitted to the school. Students born after 1956 who attend classes full-time are required to submit an immunization certification. Vocational areas of study that lead to two year degrees are in agriculture and horticulture, technology, engineering and technical studies. Six to seven classes are built into the semester based curriculums. The majority of the classes are worth three credits, other classes earn students two or four credits. The college's main campus in South Jersey's Cumberland County covers 100 acres. Students looking for vocational and trade schools in New Jersey can find them at the post-secondary level through the state’s community college system. Secondary school students can receive career and technical education (CTE) through comprehensive high schools, but New Jersey also has a unique vocational school districts system that delivers CTE to secondary students through county career academies. These academies integrate academics and vocational training around a career theme, allowing students to meet graduation requirements while getting vocational and trade skills. To find specific vocational and trade schools in New Jersey, prospective students can use this school search tool. Along with programs of study within the 16 national career clusters, New Jersey is one of four states chosen by the U.S. Department of Education to have a program of study in Green Construction, Sustainable Design and Energy. New Jersey’s public colleges must have articulation agreements with high schools that have vocational education programs. In the 2013-2014 school year, New Jersey had 78,797 secondary CTE students and 119,599 post-secondary CTE students. Slightly more female students enrolled in postsecondary CTE programs in New Jersey, and secondary enrollment had slightly more male students. Associate’s degrees and one-year certificates are favored by vocational and trade students in New Jersey over less-than-one-year certificates, possibly because of initiatives to increase dual enrollment opportunities for secondary students and ease the articulation process. However, students can still earn less-than-one year certificates through many of the same channels they can earn other credentials, like career academies and community colleges in New Jersey. The following table breaks down credential types earned by students in New Jersey and in the nation as a whole. In New Jersey, jobs requiring a post-secondary non-degree education are expected to have the most growth between 2012 and 2022, at nearly 14 percent. Jobs that require an associate’s degree closely follow at an 11 percent growth by 2022. The three industries with the most employment in 2012 are also projected to have the most growth: education and health services lead the way, followed by professional and business services and trade, transportation and utilities, so those high enrollment numbers aren’t without good reason. Health care practitioner jobs are projected to make up 25 percent of New Jersey’s professional occupations by 2022, with home health aides seeing the greatest growth. Education, training and library jobs are expected to make up 33 percent of occupations in the state. The following table shows which vocational and trade occupations in New Jersey have the most annual job openings for those with post-secondary non-degrees and those with associate’s degrees. In the Newark area, construction is the fastest growing industry. However, healthcare, social assistance and retail trade have consistently had significant hiring needs in the past. Education and health occupations are expected to increase by 10,000 jobs by 2022, making the industry Newark’s largest growing by volume. Healthcare and social assistance jobs should increase by 6,900, and professional and business services jobs are expected to grow by 5,050. There are several public schools that serve Newark’s vocational and trade students, two for secondary students and the other for post-secondary. Essex County College offers career and technical programs of study, including certificate programs in areas like computer aided design and childhood development studies that can be completed in a year. East Side High School is a comprehensive high school with career and technical education magnet programs and a program that give students the opportunity to graduate high school with 60 college credits. Essex County Vocational and Technical Schools District’s Newark campus is a CTE-specific high school offering a range of vocational programs of study to help prepare students for careers in Newark’s growing industries. State association for New Jersey’s community colleges. Provides information about schools and program offerings, including scholarship opportunities. A non-profit association representing vocational and technical schools in New Jersey. Provides information about the schools and their programs. Provides curriculum and program information about New Jersey’s unique career and technical education in green construction, design and energy. Official website for New Jersey’s education system. Provides information about various academic offerings, news and events. Provides a variety of information and statistics about New Jersey’s workforce and labor market, including wage information, employment projections, workforce development programs and resources for jobseekers. Comprehensive source of information regarding New Jersey’s higher education system, including school profiles.